Desert mirages are supposed to be make-believe. That is, of course, unless you’ve ever been to Dubai, where the real and unreal seem to blend like endless dunes that dominate this diamond of a destination. How else can one explain the miraculous metamorphosis of this tiny city-state that, just 30 years ago, was an unassuming Persian Gulf trading outpost — a place where pearl divers would return home after a hard day’s work to barastis or palm-frond huts. Now, instead of going back to modest residences, Dubai’s modern-day traders retreat to some of the most luxurious and amazing places on the planet. It’s certainly a vastly different desert picture than the one Sheikh Rashid bin Saeed Al Maktoum inherited in 1979, before he inspired his people toward a path of explosive rise to greatness. Nobody, perhaps other than the great visionary himself, could fathom the changes Sheikh Rashid’s four sons and Western-friendly emirate would eventually bring to the Middle East – or the world for that matter. Today, as the scorching sun rises after another Arabian Gulf night, a city skyline faintly comes into view over the desert dunes, leaving the mind to wonder: can this possibly be for real? Yet, past barren and brushy desert landscapes dotted with camels on miles of lonely highways, a diversified city does indeed unfold, evoking the metropolitan grandeur of Manhattan. For instance, there’s the world’s largest hotel, Burj Al Arab, shaped like a billowing sail and seemingly floating amidst the clouds. Nearby is the towering Burj Dubai, the world’s tallest skyscraper soaring more than 2,000 feet in the air, equal to the height of Chicago’s Sears Tower and the John Hancock Center combined. Meanwhile, off the coast of Dubai’ prestigious Jumeirah district, Palm Jumeirah mesmerizes the world as the largest land reclamation of its kind, an archipelago of man-made islands designed in the shape of a date palm that will one day add some 320 miles of new Persian Gulf coastline. Featuring thousands of luxury residences, retail and leisure facilities across 1,383 acres, the iconic Palm Jumeirah launched in astonishing fashion seven years ago, selling all 4,000 first-phase properties in a 72-hour period. Last November, the development marked another milestone when the 1,539-room Atlantis casino-resort hotel opened with a star-studded, fireworks-laden $20 million affair that featured Oprah Winfrey, Denzel Washington and Robert De Niro. Former Nakheel sales representative Todd Peterson, a 33-year-old luxury real estate specialist now in San Diego, witnessed much of Dubai’s transformation. “It was an amazing experience working with some of the world’s wealthiest clients and representing some of the most iconic projects ever developed,” Peterson says. “It’s not every day you get to sell man made islands! But, what I enjoyed most about living in Dubai was the diverse range of nationalities I had the opportunity to interact with. I knew people from 70 different countries. This is what makes Dubai so extraordinary. It’s the true melting pot of the world with citizens from all nations able to co-exist in harmony. My experience as an American was the living embodiment of this. Despite the fact many people I came into contact with had negative views of U.S. actions in the region, I never experienced anti-Americanism. To some extent, all of this must seem like one surreal mirage surfacing from the Dubai desertscape. In this case, though, it is real. Or is it? In some respects, it’s a little of both now that the global financial crisis is firmly entrenched in the United Arab Emirates, drastically cutting off many of Dubai’s most ambitious projects and stifling the city-state’s once high-flying economy. As the late Sheikh Rashid’s son and current Dubai ruler Sheik Mohammed bin Rashid al Maktoum has harshly learned, not even the oil-rich United Arab Emirates, which he helps run as the vice-president and prime minister, is immune to the crippling whims of the global credit crisis. 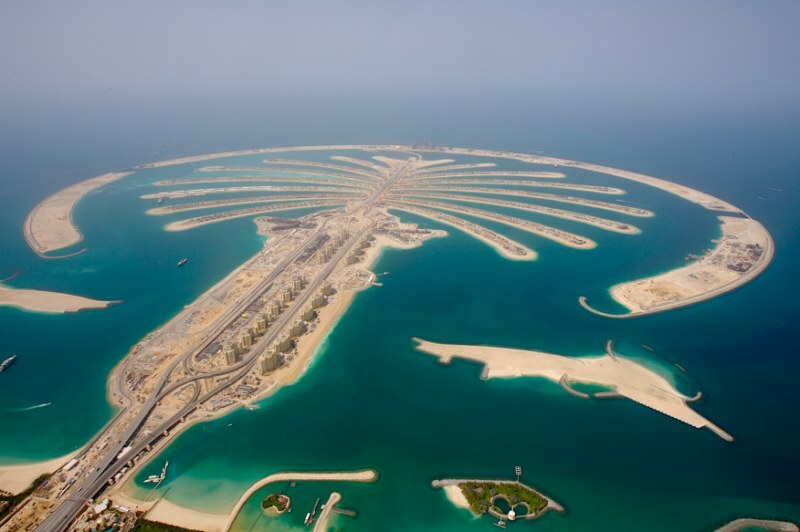 That explains why Nakheel, the state-run development arm, has all but called off every master-planned real estate project except Palm Jumeirah, an innovative development some call the eighth man-made wonder of the world. One noted high-profile casualty on Palm Jumeirah is the proposed Trump International Hotel and Tower. Subsequently, numerous other high-profile upscale real estate projects have been put on hold, including Tiger Woods ballyhooed Tiger Woods Dubai golf course community. Scheduled to open this autumn, Woods confirmed in June his project that featured so-called palaces starting at more than $30 million is indefinitely on hold and pushed back to 2010 or later. Basically, several months after the financial markets began to melt down last September on Wall Street, Dubai started to feel the global aftershocks and its own real estate market was soon in jeopardy. For example, a four-bedroom villa on Palm Jumeirah dropped some 40 percent in value to $2.7 million or 10 million UAE dirhams, down from $4 million or 15 million dirhams, respectively. When the Palm Jumeirah initially sold these villas in ‘02, purchased by the likes of soccer star David Beckham and F1 race car driver Michael Schumacher, some were bought for as much as $7 million. Indeed, like any mirage in a desert, the vision ultimately does eventually disappear, right? Simply put, this desert dreamland has awakened to a nightmarish economic hangover not unlike so many economies riding the real-estate bubble around the world Yes, even a region at one time awash in so much oil-driven liquidity that it was buying up brands such as NASDAQ, Cirque de Soleil and the Atlantis resort chain, is now broke. And Dubai has found itself in a state really no different than other over-fueled speculative real estate and financial markets needing massive bailouts from Miami to Phoenix to London. Despite this general gloom and doom, however, not all of Dubai is dying. A 10-acre development by V Resorts Limited, V … Greece on the World is the only project on the island of Greece and features 54 units overall, half of which are already sold. Designed as a “village by the sea, Belgian entrepreneur/developer Jean van Gysel, strives to fulfill every need imaginable with the finest of facilities and amenities including a Cinq Mondes Spa, fitness center, shops, restaurant, business center, private moorings and its own private ferry that shuttles residents to The World’s other ferry terminals. Prices for V residences range from $3.5 million to $8 million for 60 days of annual freehold use. The remaining 10 months allow investors to rent their ‘hotel suite’ and receive 50 percent of the gross sales per year. Richard Steinberg, executive manager director for Warburg Realty Partnership, acknowledged there isn’t a single development in Dubai not affected by the global recession, but V…Greece on the World project is holding its own due to its intimate small-scale nature. One person not shy talking about Dubai and its global grandeur is Bala Balasubramaniam, chief executive officer of Dubai Sports City. 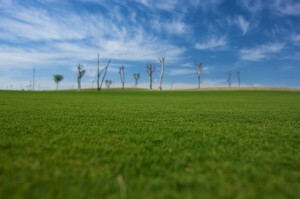 Another desert location where only spindly trees once sprouted, two lakes are now improbably nestled among 18 perfectly groomed championship-caliber golf holes designed by star golfer Ernie Els. Opened last January, the Els Club, Els’ first project in the Middle East, is the first fully functioning part of the extraordinary Dubai Sports City, a city within a city that features world-class sporting facilities, cutting-edge stadiums, and a variety of world-renowned sports academies. 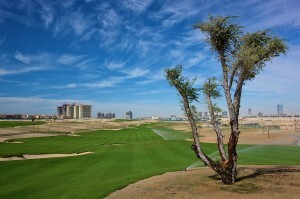 Launched in 2004 as part of Dubailand and situated adjacent to the Dubai Autodrome, the new $4 billion, master-planned mixed-use Dubai Sports City development is taking shape as the eventual home to a community of 70,000 people living in 970 gated villas and more than 100 residential towers. In most places, such expansive and expensive plans would be unthinkable. But this is Dubai, the go-go business hub of the United Arab Emirates. Sports is a multi-trillion dollar industry, and Dubai has recognized that it can profitably serve as the nexus between the Eastern and Western hemispheres, not to mention a safe and enjoyable beacon for 1.7 billion people living within a 4-hour flight of the Emirate. That, in a nutshell, is the biggest gambit of the Sheik’s aggressive expansion efforts on many fronts – to be the center of the world’s hemispheres for financial services, tourism and sports and leisure. 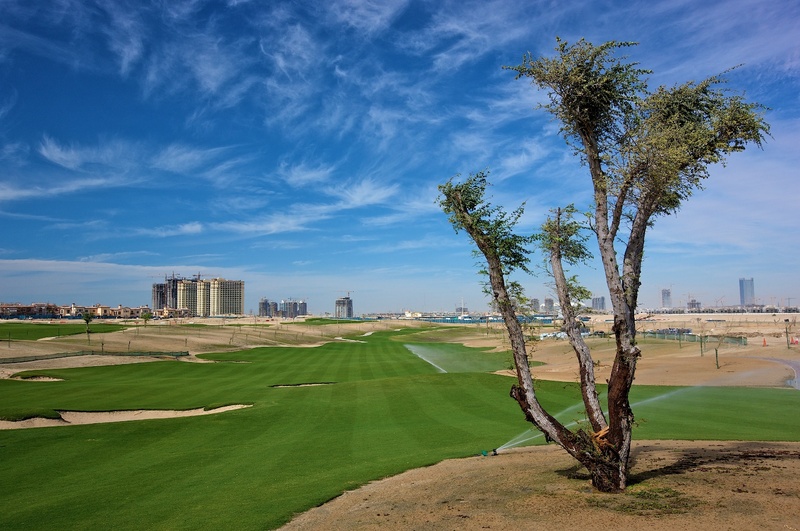 Balasubramaniam is pleased to report his $13-million Els Club, a low-density 1,250-acre community central to the Dubai Sports City development, is more than 30 percent sold out, including 956 phase one villas priced from $1 million to $3.5 million. And Balasubramaniam is quick to point out that 90 percent of Dubai Sports City’s first phase is sold, and 72 percent of the buyers are end users living there to actually enjoy the sports, leisure and health and wellness elements, not speculators that have fueled so many other Dubai developments. Meanwhile, the semi-private Els Club’s first release of memberships (150 in total) sold out in a matter of weeks, priced from $35,000 for individuals and $85,000 for corporate memberships. The second and final release of 100 memberships is scheduled for later in the year with more than 100 names currently on the waiting list. By no means, Balasubramaniam will tell you, is the Dubai boom over. So the 50 million-square-foot Dubai Sports City development moves on, featuring numerous world-class sporting facilities, including three state-of-the-art stadiums and a variety of renowned sports academies highlighted by soccer’s elite Manchester United organization. In addition to the sporting facilities, Dubai Sports City has plans for other major residential and commercial developments, including a mall and various retail hubs, international schools, medical facilities, hotels, community centers and entertainment venues. Among the initial sports partners besides Els, Dubai Sports City features the only Butch Harmon School of Golf outside of America, a 25,000-seat cricket stadium and partnership with the governing International Cricket Council, a 60,000-seat multi-purpose stadium, 10,000-seat Indoor Arena, David Lloyd Tennis Academy, Next Generation Health Club and more. Turning the emirate into a sports and leisure destination has been a goal for quite some time. Major sporting events are not new to Dubai. The Dubai Tennis Championship, which made its debut in 1993, attracts many of the top players in the world, and the Dubai Desert Classic, a stop on the PGA European Tour, started in 1989. Horse racing has also enjoyed an international stage, with Dubai hosting the world’s richest race. And now, with the Dubai Sports City underway, the stakes are being raised, and all of this high-profile exposure could be the key to Dubai becoming the first Arab city to host the Summer Olympics. This March, Sheikh Mohammad confirmed he is considering bidding for the right to host the games. If selected, the earliest opportunity is 2020. In the end, though, will Dubai just become a cityscape of half-finished buildings? Or a mirage that does indeed see the light of day. The modern-day visionary behind all of Dubai’s dominance of the region’s profile is Sheikh Mohammed. With its oil supplies dwindling, Sheikh Mohammed had a strong desire to transform his emirate and create a new level of prosperity for his people. So Dubai diversified its economy into real estate and tourism, financial services, and other interests, in the boldest and biggest of ways, building the tallest skyscraper in the world, the Burj Dubai, the largest indoor ski resort, the largest mall and more. At one time it was believed that Dubai had more skyscrapers planted on its sand than the world had collectively. In the process, Nakheel’s Palm Jumeirah, Emaar Properties’ Burj Dubai, and Jumeirah Group’s Burj al Arab, arguably became three of the most iconic images of the recent global real estate boom. What many people probably don’t realize is Dubai is actually one of seven emirates that compose the United Arab Emirates, with neighboring Abu Dhabi being the oil-rich capital and emirate with more than 85 percent of the UAE’s land mass. The seven emirates, or states, are bound together in a longstanding and relatively stable federation dating to 1971. Abu Dhabi, one of the world’s largest oil producers, provides the majority of the federation’s spending. On the other hand, Dubai doesn’t have and really never had much oil to bolster its finances, thus the move by Sheikh Mohammed to diversify and create its own revenue-generating identity. The emirates govern independently, but the ruling families are hereditary monarchs with sometimes competing business, political and diplomatic interests. Like many of the Middle East governments, Dubai was on a deal-making development binge over the past couple years. Companies owned or backed by the government signed agreements or made investments for billions of dollars in assets, including stakes in American and European stock exchanges, a Las Vegas casino operator and Sony Corp. But much of Dubai’s deal-making was financed by international borrowing, and a large chunk of that debt came due in the past year. Meanwhile, other Dubai entities embarked on massive expansions inside and outside the emirate fueled by public borrowing. Government-controlled Nakheel, the world’s largest privately held real estate company, was a prime example when it placed $750 million in bonds in December ’07 to finance its plans. In the past few months, though, Dubai’s rapid rate of development, accompanied by increased levels of leverage, finally came back to haunt many of the country’s leading developers evident by the massive layoffs experienced at Nakheel earlier this year and the shutdown of most projects. By contrast, Dubai’s neighbors and some of the region’s biggest investors like Qatar, Kuwait and Abu Dhabi, huge hydrocarbon reserves to back up their deals and cushion their economic crashes. While Dubai works through its financial strains and pains, many experts believed and expected its much wealthier cousins in Abu Dhabi, would be there to lend necessary support. And that’s precisely what happened in February when the U.A.E. government announced it would spend $10 billion to bail out the once-highflying emirate whose huge construction and financial-sector expansion plans became a symbol for the region’s boom times, and now of a worldwide recession. The cash infusion from its neighbors comes as Dubai’s once-soaring real-estate market comes crashing down much like it has in the States and other global markets. Falling prices, some down by 50 percent or more, have burned speculators who never intended to hold onto the property in the first place. Consequently, sales have plummeted, tightening cash flow for developers, which are now shedding employees and canceling or postponing billions of dollars worth of projects and scrambling to extend debt payments. Robert Lee, managing director of investment projects for Nakheel, says the rise and fall of Dubai’s real estate fortunes is merely a function of what truly is a capitalist city-state. When asked how to describe the future of the bubbling Dubai real estate market, Bala was optimistic, sharing the following wisdom. It’s a description that can be used for much of the world right now. Or, is it really all just one big mirage. Editors Note: This story originally appeared in the Aug./Sept. 2009 edition of Ocean Home.